No house plants are ever truly self-watering, but with a little ingenuity, it is quite simple and inexpensive to set your hanging baskets up to be almost self-watering. 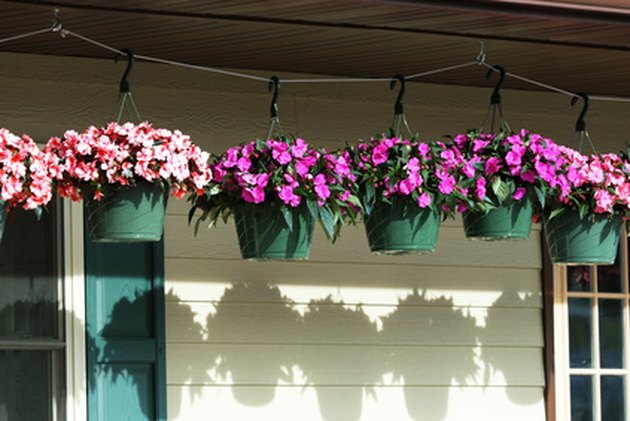 Hanging baskets can dry out quickly, so relying solely on rainfall, especially with varying rain patterns throughout the country, your beautiful flower baskets could wither and die. Being able to water them just once a week is much more convenient than having to tend them every day. Pierce the base of a small plastic disposable drink bottle with a piercing tool, leaving the cap on, and insert a 4-inch length of tubing into the hole, with approximately 1 inch of the tubing inside the bottle and the remaining 3 inches protruding outside the base of the bottle. Ensure that the tubing fits firmly and cannot slip out of the hole. Insert the basket liner into the wire basket. Place the bottle into the basket liner with the base and tube facing downward and the cap still on the bottle. Fill the basket liner with potting mix. The cap on the bottle keeps the soil from falling into the bottle. Position the bottle so the top one-third of it is protruding from the top of the basket. Remove the cap and discard it responsibly. Pot the plant into the potting mix and water the basket thoroughly, filling the bottle with water at the same time. Watering the potting mix should only be necessary initially, as the water should drip-feed through the tube and maintain the moisture level. Hang the basket in the desired location. Check the basket every few days, and top off the water in the bottle only when the soil is drying out.